Eggs in the microwave usually spell disaster. There's nothing like cleaning molten egg yolks out of the microwave -- or, for the very unfortunate, out of your hair -- to get the day started. Surprisingly, you have to bend one of the golden rules of microwaving to properly soft-boil an egg. You have to use aluminum foil. Submerging the egg in water prevents the foil from arcing, and the foil protects the egg from the microwaves that cause it to explode. These methods are based on a 700-watt microwave set at 80 percent power (high power). 1. On a stove-top, bring 1 quart of water to a boil. Wrap 1 to 3 eggs in aluminum foil. **The foil protects the eggs from exploding from contact with the appliance's microwaves. 2. 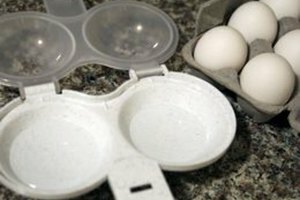 Place the eggs in a microwave-safe container with sides approximately 1 inch deep (i.e. a recycled egg carton) . Pour the boiling water over the eggs, until they are 1/2 inch covered. **Submerging the eggs in water prevents the foil from arcing when heated. 3. Microwave the eggs on high for 3 minutes. Take the eggs out of the microwave, let stand to cool, then remove the foil. 4. Check to see if the eggs are done. 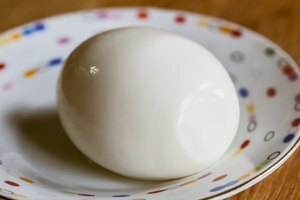 If the white is loose and drippy, set the entire egg in a bowl and cover it with water. Microwave the egg for 20 seconds at 60 percent power (medium). 5. Crack the eggs on a flat surface and open them into a wide microwave-safe bowl. Pierce the yolk with a toothpick. Add 1/3 cup of water to the mug. 6. Cover the bowl with microwave-safe plastic wrap or a saucer. Microwave the egg for 1 more minute. 7. Check again to see if the eggs are done. Remove with a slotted spoon and serve. The egg white will wobble a bit when you take it out of the microwave, but will set by the time it cools.